1976 Qualified as Search and Rescue Dog handler. 1985 Qualified Assessor of Search and Rescue Dogs. 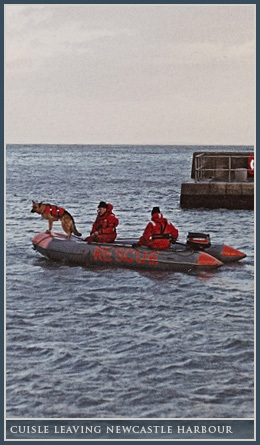 1992 Trained first ever Water Search Dog in UK. 1998 Trained drugs dog under ex Home Office examiner/instructor. 1999 Training Officer for Canis Specialist Search Dogs. 1999 Trained in Leisure Trade security services. 2000 Accepted as Specialist Support Services for UKFSSART. 2001 Trained explosives search dog with the military. 2002 Accepted as Specialist Support Services for NI Fire Service. 2003 Member of British Institute of Professional Dog Trainers. 2004 Chairman of S A R D A (Ireland – North). 2004 Appointed dog handler to NI Fire Service USAR Team. 2005 Invited by ODPM to be search dog instructor at UK Fire College. 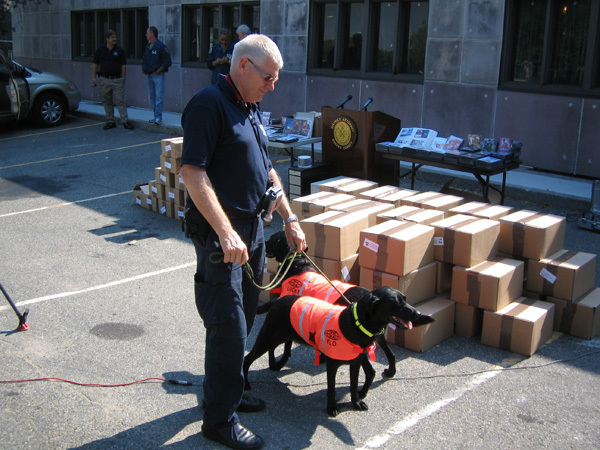 2005 Trained an Arson Detection Dog for an Italian commercial team. 2006 Trained World’s first optical discs detection dogs. 2007 Trained second pair of optical disc detection dogs for Malaysian Government. 2008 Cooperated with John to run the first Drowned Victim Search Dog course in UK & Ireland. 2008 Cooperated with John to write the Training and Assessment standards for Drowned Victim Search Dogs at the request of NSARDA. 2008 Neil set up SPEK-9 Services along with John Sjoberg in response to many demands from the dog training world. 2008 External assessor of mountain, lowland and drowned victim search dogs for National Search and Rescue Dog Association, ( NSARDA). 2008 Training Officer for British International Rescue Dogs. 2008 Assessor of International Search Dogs. 2009 Charco is shortlisted for the Hero Dog Award, part of the Dogs Trust Honours 2009. 2011 Trained first trailing dog in Ireland to NSARDA standard. 2011 Qualified first trailing dog in Ireland to the National Search and Rescue Dog Association standards. 2011 Neil's book 'Search Dogs and Me', published by Blackstaff Press, was launched. Qualified as a Search and Rescue Dog Handler (SARDA). Search dog Kim located a missing person in the Mourne Mountains. Involved in many other searches with this dog in Ireland and Scotland. Trained second SARDA dog, Pepper, which later located ten missing persons in the Mourne Mountains and a lost young German scout in the Donegal Mountains. Deployed to Lockerbie disaster & Warrenpoint bombing where Pepper located many body parts. Appointed as Assessor of SARDA dogs for The Lake District and North Wales. Appointed as International Search Dog Handler as part of CANIS Specialist Search Dogs. Founder member of International Disaster Search Dogs, (IRO), based in Vienna. Trained Cuisle, first ever Water Search Dog in the UK, for the location of drowned persons in large expanses of water. Cuisle went on to locate six drowned persons. Trained second and third water search dogs, CJ & Cracker, which later located two drowned victims. Deployed by the Home Office to two earthquakes in Turkey with two disaster dogs, Dylan & Cracker which located numerous persons, both dead and alive; also to earthquakes in Algeria and Kashmir where newly trained disaster search dog, Charco, located one live casualty. Trained third mountain SARDA dog, Dylan, who has found 4 missing persons. Dylan also deployed to Ibiza to search for missing English tourist. Trained drugs dog for passive indication, people-scanning under instruction of ex Home Office examiner/instructor D Mayberry (RUC). Trained passive indication explosives search dog under supervision of RAF Police Dog Section, assessed by D Mayberry. Trained commercially, further 4 explosives detection dogs. 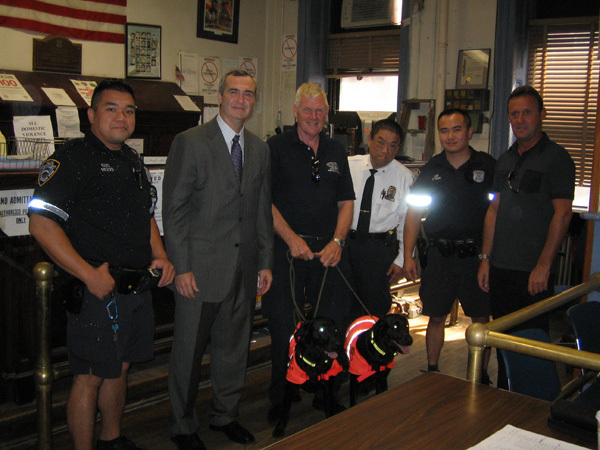 Trained two dogs, Lucky & Flo, to detect concealed pirated optical discs on behalf of Motion Picture Association of America. These dogs have currently located £1.75 mill. counterfeit optical discs in Malaysia and thousands in Queens area , New York. 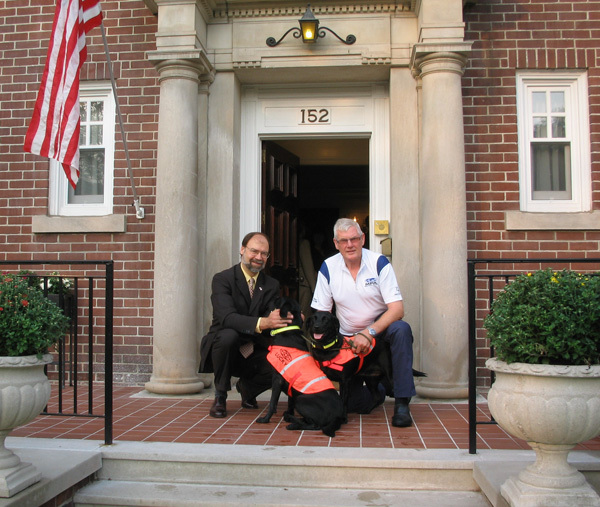 Trained an arson detection dog for Torre Fire and K-9 Response group in Bologna. Trained fourth water search dog, Fern, which has located two bodies in a lake. Trained in Risk & Security Management studies for the Licensed Trade Leisure and Entertainment Industries in N I.
Lectured on and demonstrated dog training skills to numerous national and international delegates at seminars/conferences worldwide e.g. Malaysian Fire Service, Irish Civil Defense, Hong Kong Customs, NYPD, Dubai Customs, HM Customs & Excise. Currently works two DVD/CD detection dogs, an Explosives search dog, a Water search dog and two Disaster search dogs. Worked explosives search dog at Canary Wharf, the Dome and at MCC ground at Lords. Among VIPs at Lords were HM Queen Elizabeth, Duke of Edinburgh and John Major. Currently works as dog trainer and behaviorist and specialist search dog trainer for NIFRS. Provides Tailing Dog and DVS dog to PSNI to search for missing persons as required. Neil and Consul General in Toronto. 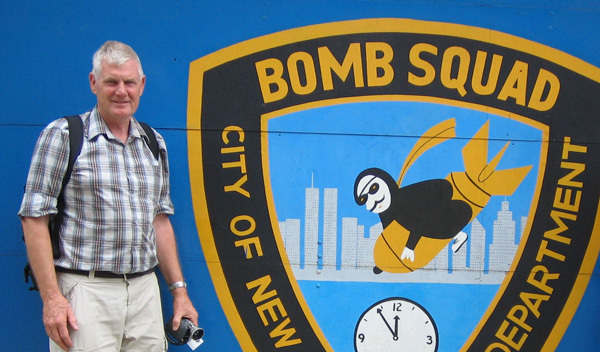 Neil and the Bomb Squad. John Malcolm and Neil being interviewed by CNN. Neil with Lucky and Flow in New York. Neil and Flo doing a TV interview in Toronto. Neil with John Malcolm and Officers of NYPD.